﻿ What is barcodes and International Article Number (EAN)? What is International Article Number (EAN)? 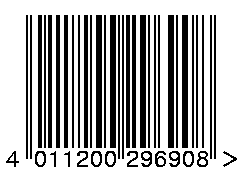 An EAN-13 barcode (originally European Article Number, but now renamed International Article Number even though the abbreviation EAN has been retained) is a 13 digit (12 + check digit) barcoding standard which is a superset of the original 12-digit Universal Product Code (UPC) system developed in the United States. The EAN-13 barcode is defined by the standards organization GS1. GTIN-13 number encoded in EAN-13 barcode. First digit is always placed outside the symbol; additionally a right quiet zone indicator (>) is used to indicate Quiet Zones that are necessary for barcode scanners to work properly. An EAN-13 number consists of four areas: (1) The number System; (2)The manufacturer code; (3) the product code; (4)The check digit. Normally the number system digit is printed to the left of the barcode, and the check digit to the right. The manufacturer and product codes are printed merely below the barcode, separated by the guard bar. Number System. The number system is the first two digits in the EAN number to identify the country/region numbering authority. Manufacturer Code. The manufacturer code is a unique code assigned to each manufacturer by the numbering authority indicated by the number system code. All products produced by a given company will use the same manufacturer code. EAN uses what is called "variable-length manufacturer codes." Assigning fixed-length 5-digit manufacturer codes, as the UCC has done until recently, means that each manufacturer can have up to 99,999 product codes - and many manufacturers don't have that many products, which means hundreds or even thousands of potential product codes are being wasted on manufacturers that only have a few products. Thus if a potential manufacturer knows that it is only going to produce a few products, EAN may issue it a longer manufacturer code, leaving less space for the product code. This results in more efficient use of the available manufacturer and product codes. Product Code: The product code is a unique code assigned by the manufacturer. Product Code. The product code is assigned by the manufacturer. The product code immediately follows manufacturer code. The total length of manufacturer code plus product code must be exact 10 digits. Check Digit: The check digit is used to verify that the barcode is generated or scanned correctly. The check digit is calculated based on the rest of the barcode digits. 1. From the right to left, start with odd position, assign the odd/even position to each digit. 2. Sum all digits in odd position and multiply the result by 3. 3. Sum all digits in even position. 4. Sum the results of step 3 and step 4. 5. Divide the result of step 4 by 10. The check digit is the number which adds the remainder to 10.